Pierogi is Poland’s National dish: you can’t leave the Country without trying them. Everyone loves this particular kind of dumplings, to the point that at the last festival in Krakow over 30000 pierogi were consumed daily by locals and tourists. 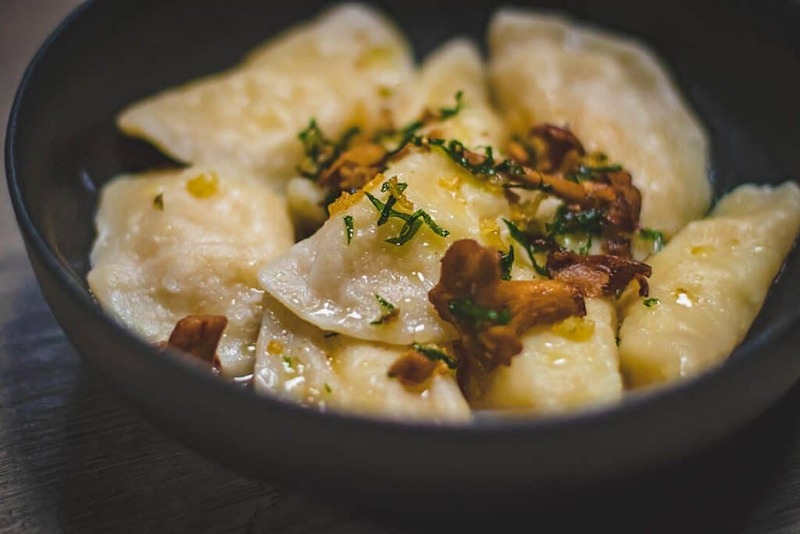 Let’s see where to find the best pierogi in Krakow, according to us, and what should you expect in terms of prices and location. 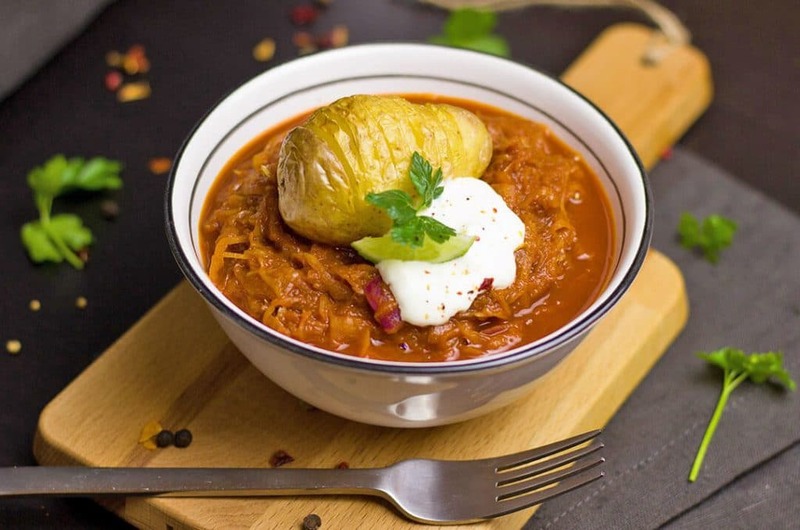 Traditional Polish cuisine, rooted in Slavic fare, was suppressed like all the other aspects of Polish culture during the Communist era. Yet in the last few years the flavour of the old recipes has been rediscovered and enhanced by a new generation of chefs. Yet some things haven’t changed at all. Potatoes still act like a building block for many dishes, often together with cream and eggs, even if today’s recipes are generally less heavy than they were in the past. The food in Poland is always an explosion of flavor and colors: it can be quite complex and yet it never fails to disappoint. During our long weekend in Krakow we’ve realized that the city is full of restaurants and that sometimes it’s difficult to choose what to eat or where. Yet if there’s one thing we have learned is that food in Krakow is way less expensive than what we’re used to. We weren’t expecting it to be with a Fiorentina steak in Florence, and yet we realized it’s even cheaper than pizza in Naples. And considering the fact that pizza is cheap here if you know where to eat it, that is saying plenty! Pierogi are medium sized dumplings made with an unleavened dough (a bit like flatbread) and stuffed with different fillings. 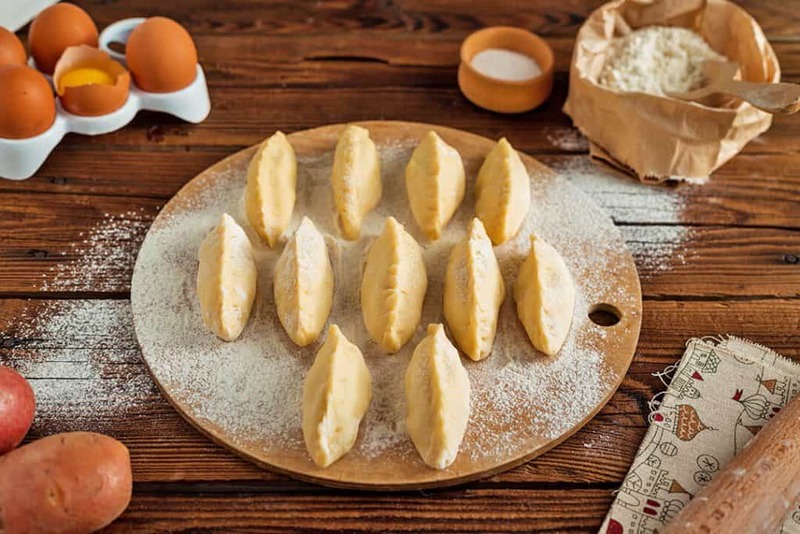 The Polish recipe dates back to the 13th century, but you will find pierogi on the menu also in Countries like Russia, Lithuania, Ukraine and Slovakia. In the past they were the kind of food you’d eat for festivities like Christmas and Easter, or for events like a marriage. Today the Polish still prepare specific types of fillings for each festivity, just like in the past. For example on Christmas eve they cook pierogi with cabbage, sauerkraut and mushrooms. Someone even told us that during the festivities you can eat the best pierogi in Krakow because the city really takes the holidays pretty seriously! The Polish dumplings are very versatile, to the point that not only there are lots of fillings, but they can be cooked in several ways. Just so you know, deep fried pierogi are a thing. 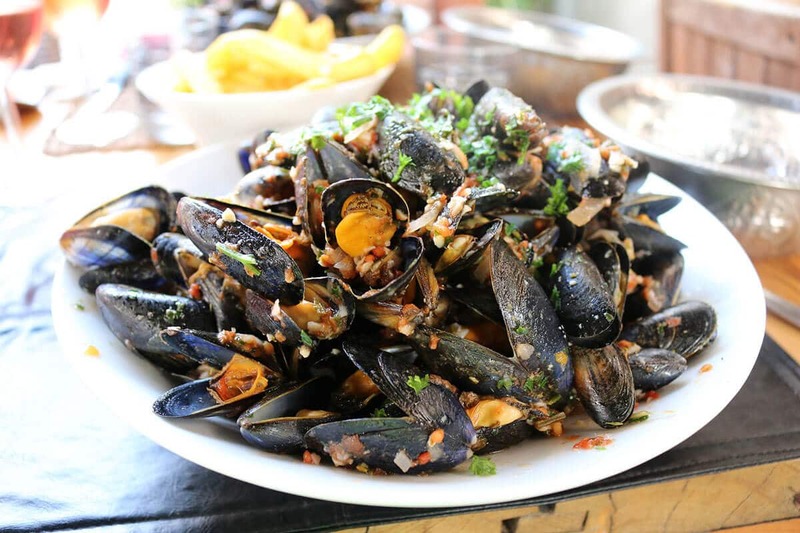 The most used fillings are forcemeat, sauerkraut and mushrooms. 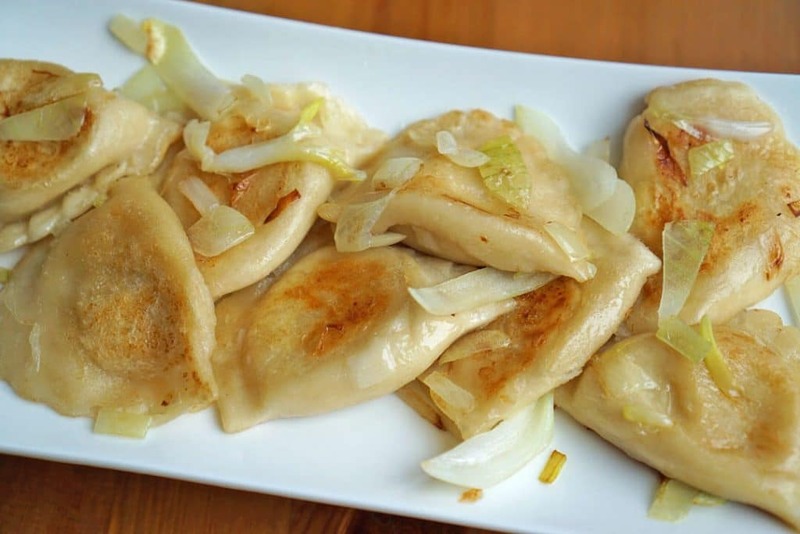 Some of the best pierogi in Krakow are mentioned in English menus as Russian pierogi. You will find them in each and every pierogi restaurant in Krakow. We thought that it indicated a Russian origin, but the owner of one of the restaurants we visited told us that it refers to Ruskie pierogi, which are filled with potato and cheese. They’re one of the variants we loved the most. Also the all cheese pierogi are delicious: we always ordered one of each so we could share and taste some of both. According to the kind of filling you choose, pierogi are served with fried onions, bacon or pork scratching on the top. If you want to plan your trip to discover Krakow through food, make sure you taste all the different combos! In the summer you will find also sweet pierogi filled with seasonal fruits like strawberries, or with a sweetened Polish curd cheese. While we wanted to add the sweet version to the list of the best pierogi in Krakow, we’ve visited the Country in Winter. With all the snow and cold, the restaurants didn’t have sweet pierogi but other cakes that we’ll mention by the end of this article. Not that we’re complaining, but we’ll have to get back with the warm season: we’re really curious to try strawberry pierogi now! Kazimierz is the Jewish district in Krakow, at the South of the Wawel hill. Before 1945 over 65000 Jewish people used to live here. But Krakow was deeply wounded by the Nazis during World War II: all the Jewish people who used to live in Kazimierz were brought to the Auschwitz-Birkenau camps. Today only about 300 people live in this district. And yet, in between synagogues, cemeteries and artworks, you will find many restaurants and shops. Kazimierz has become a touristy district, very lively at night, and yet it hasn’t sold its soul to the mass tourism. It hasn’t become one huge luna park, but it still preserves the soul of what once was. We choose to stay at a hotel here, the Kazimierz III, to be able to go out at night without having to get the car or public transport. We never regretted our decision! Pierozki u Wincenta is a tiny (really tiny) restaurant that offers some of the best pierogi in Krakow, with several fillings. They also serve deep fried pierogi and if you’re very lucky you will also find a sweet pierogi with seasonal fillings. According to the locals (and we agree) they serve some of the best pierogi in Krakow. Miodova is a combination of tradition and modernity. This wonderful restaurant has been also mentioned on the Michelin guide for Krakow. It’s particularly classy, and serves delicious pierogi inside of an historic building. Their menu wants to reinterpret the Polish cuisine traditional recipes in a modern way: make sure you book in advance! Stare Miasto is the Old Town Krakow, the ancient part of the city, UNESCO protected and located inside the city walls and the Planty park. 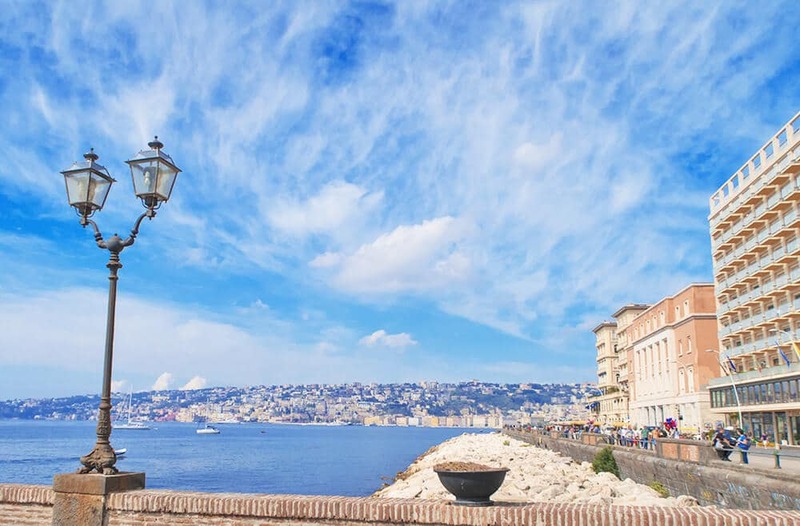 The view on the medieval part of the city is breathtaking. Stare Miasto is full of art and history. Its heart is Rynek Glowny, the biggest medieval square in Europe, where you will immediately recognize the two towers of the St. Mary’s Basilica. It’s one of the pictures of Krakow you’ll find everywhere on Instagram (yes, I’m also guilty for posting one!). Inside the Stare Miasto you will also find the university district, which is full of shops and restaurants. 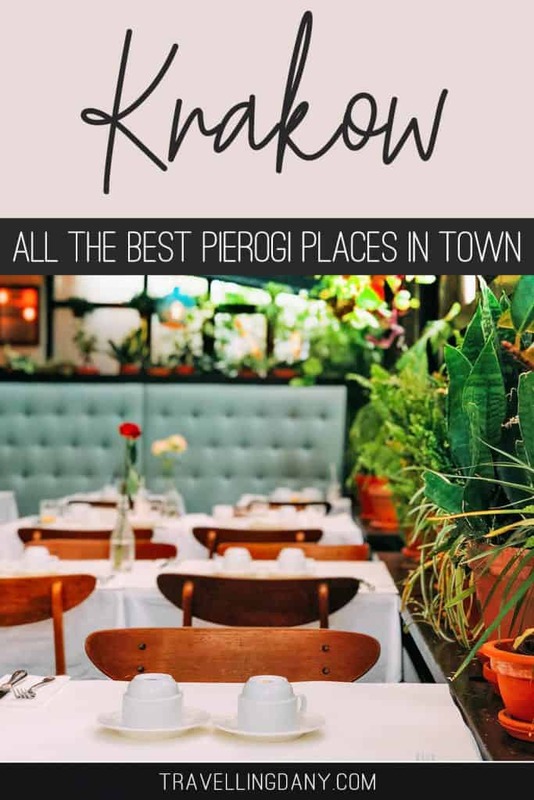 Because here there are a lot of students, you will find many pubs, steakhouses and international restaurants (which is also why it wasn’t difficult to find some of the best pierogi in Krakow’s Old town!) on the cheap. Yet let me tell you again: eating in Krakow is very cheap anyway! If you want to do some shopping, beware: the shops all around the Rynek Glowny and the Ulica Florianska sell lots of plastic souvenirs. Not only they aren’t cheap but they also look ugly. Just walk around. In the narrow, less touristy streets of the Stare Miasto you will find much better stuff, including handcrafted items. We bought small kittens carved in wood and hand painted by local artists for our friends and family in stead than the usual magnets: they all loved them and the price was incredibly low too! Pierogarnia Krakowiacy is a traditional restaurant that only serves pierogi and a few soups. The prices are very low but they have some of the best pierogi in this area, which can be a bit above average when it comes to the bill. While at lunch you shouldn’t have any problem in finding a table, in the evening it can be pretty crowded! Wierzynek Restaurant is an historical (and very romantic) restaurant in the heart of Stare Miasto. Not only they have some of the very best pierogi in Krakow but they serve delicious Polish and European dishes. 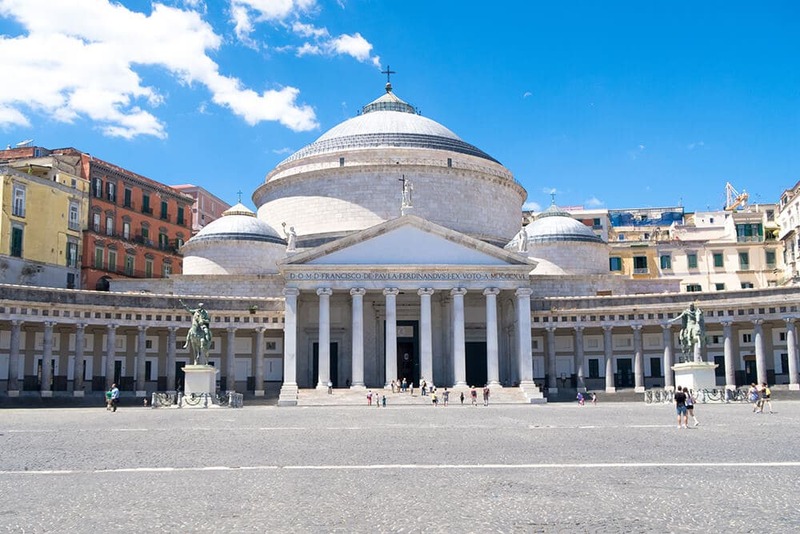 This luxury restaurant will make you feel like dining in a Royal Palace. Upon request you’ll also be able to tour the whole location: the staff is always very happy to dish out (pun intended) legends and curiosities about the Wierzynek Restaurant. If you walk out of Ulica Florianska, past the nice park, you will get to Kleparz. All the artisans working in Krakow used to live here. 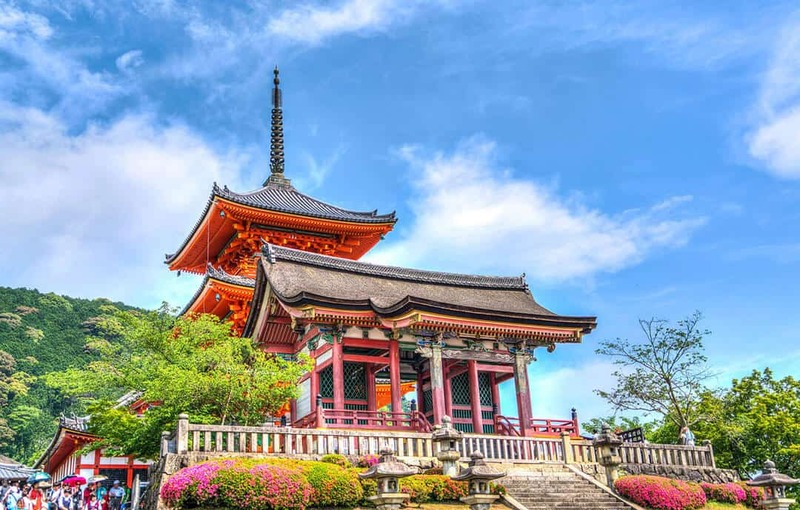 The houses were made in wood and were often destroyed by huge fires. Only in 1972 Kleparz became part of Krakow, and it was rebuilt in stone, using the same neoclassic/art nouveau style that you can see at Stare Miasto. Because the mass of tourists generally stops in the Old Town or in Kazimierz, Kleparz is a good alternative if you want a more quiet district. The restaurants are also pretty good. Chata is the restaurant you wouldn’t expect. Inside, you will be welcomed by big wooden tables decorated with fake furs, in an atmosphere that almost makes you feel like you’re sitting in a mountain cabin… in the heart of the city. While they have some of the best pierogi in Krakow, we recommend you also try their goulash (see below). It’s delicious and comes in a loaf of bread! Jarema Restaurant is a restaurant that feels like home. The inside looks like a traditional Polish house, and in the evening they also lit candles on the tables. The presentation of food is classy, they make sure the aesthetics are perfect but don’t expect huge servings. The pierogi with caramelized onions are particularly good! It’s not difficult to recognize the Wawel hill. It’s the one with the Royal Palace on the top, protected by high walls and the Vistula river. Inside the castle you will also find the Krakow Cathedral, where Pope John Paul II (Karol Wojtyla) used to be archbishop. While of course you won’t be able to eat inside the castle, there are a few restaurants in the area that you can go to. We walked from our hotel to the Wawel hill, in Winter. It was a particularly cold day. Our first in Krakow. When we climbed down, we met a young woman who was selling the traditional Polish bread in her little kiosk. This kind of bread looks like pretzels, or thin bagels, with poppy seeds or sesame seeds on the top. The young woman had seen us walking by, it was snowing and to tell you the truth, she was bored out of her mind. Her friend wanted to go home with her so how about we buy some of her bread? She couldn’t close the shop if she hadn’t sold everything she had. Her English wasn’t great, and we understood one word out of three. What she was trying to tell us is that she was going to prepare a plastic bag for us with her best bread. We asked her how much we owed her and the price for a full bag was… the equivalent of 0,30€. We argued fiercely. We couldn’t accept: it wasn’t enough and we felt like we were robbing her! But she almost got offended. There was no way she was going to accept “all that money”, and in the end, she just told us that it was her way to welcome us to Krakow, so we just had to accept. Did I already mention that the Polish are very friendly and welcoming? Kuchnia u Doroty is technically between Kazimierz and the Wawel area. This cozy little restaurant offers huge servings for tiny (and I mean really tiny) prices. They serve some of the best pierogi in Krakow but because they have really big servings, unless you’re very hungry just order step by step. 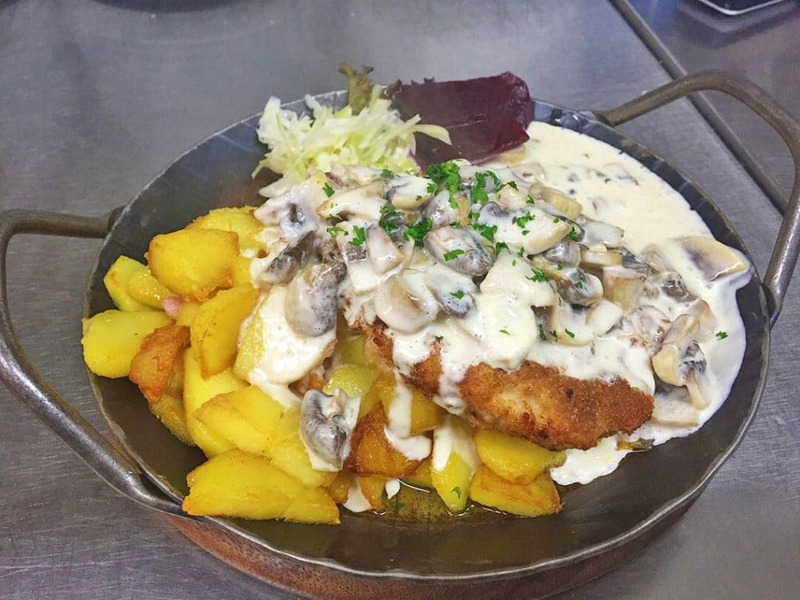 If you’re still hungry after eating pierogi you can order another dish. Believe me, a serving of their pierogi will definitely fill you! Restauracja Kurka Wodna is located in a beautiful, historical building and is particularly well known in town because they serve some of the best pierogi in Krakow. They also serve several dishes in cereal bread. The beer is good and the servings are pretty big. Expensive if you compare it to other places in Krakow, but to us it was definitely well worth the price. If beer is your thing, then you’ll be happy to know that Poland has seen an upsurge in small breweries. Polish beer (Piwo) is cheap and very good, according to Aldo. This explains also why Poland is becoming a popular destination for stag parties and beer lovers. There are about 90 breweries in Krakow, offering local craft beer as well as beers imported from Europe. Of course the local craft beer is much cheaper than the imported ones but the prices are still pretty low. On average a pint will cost you the equivalent of 2€. Makowiec: A yeast cake stuffed with ground poppy, raisins, almonds or walnuts. It’s generally covered with icing and orange peel. If you’re visiting Krakow in the cold months have a look at our super-useful packing guide for Europe in winter to learn a few hacks and steal some cool outfit suggestions! Oh my, I love pierogi! In Canada, it’s spelled as perogie. We have a lot of immigrants from the Ukraine here and they often bring perogies to parties. They’re heavenly, especially with sour cream! I wonder what sauerkraut pierogi tastes like. You’re SO lucky! 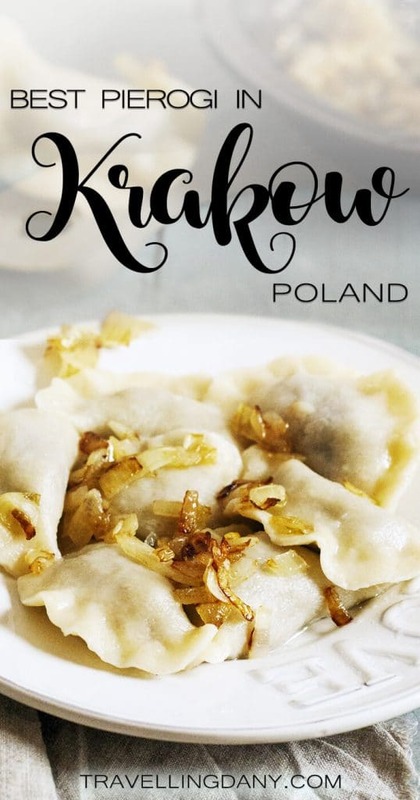 Here we can’t find any Polish restaurant so I’ll have to try and make pierogi myself 😀 I’ve never tried them with sour cream but I bet they’re delicious! 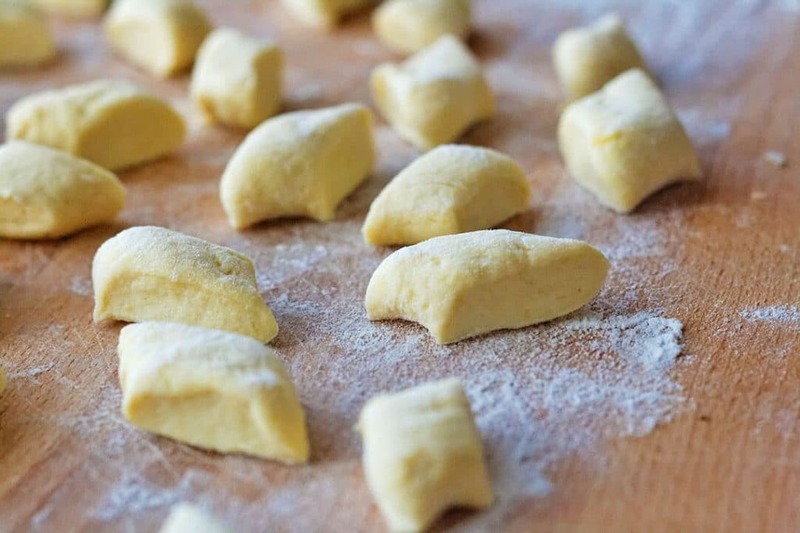 Pierogi sounds so fascinating, so also the fact that it has a long history. I was so fascinated by it that I went ahead and a bit of research on it. What really amazes me is that a similar kind of dish is prepared in many parts of India especially during festivals. Only the filling would be different and consist of a sweet mix of coconut, sugar, jaggery, etc.. I think that back then the recipes traveled faster than today 😀 As far as I knew it came from China, but you never know! I was also thinking of trying that! If you find a good recipe let me know! Note to self: do not read any food blogs when you’re hungry! I’ve never had a true pierogi from Poland – just the cheap store bought ones from the restaurants here in North America. I’ll have to make a trip just for these! Whoah I feel like I know everything about Pierogi now! After reading this though all I want to do is try them!!! Get me to Poland asap! 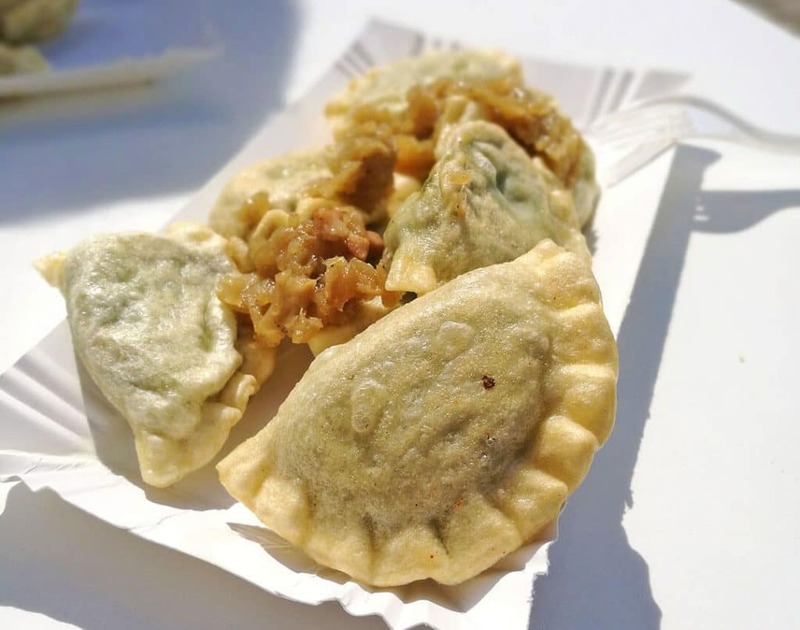 Thanks for the introduction to Pierogi – I haven’t yet made it to Poland, but it sounds like it’s worth a trip almost solely for the food scene! It’s fabulous to hear that flavour of the old recipes has been rediscovered recently – would be great to get a feel for the traditional recipes and then visit some restaurants where new chefs have incorporated modern techniques. 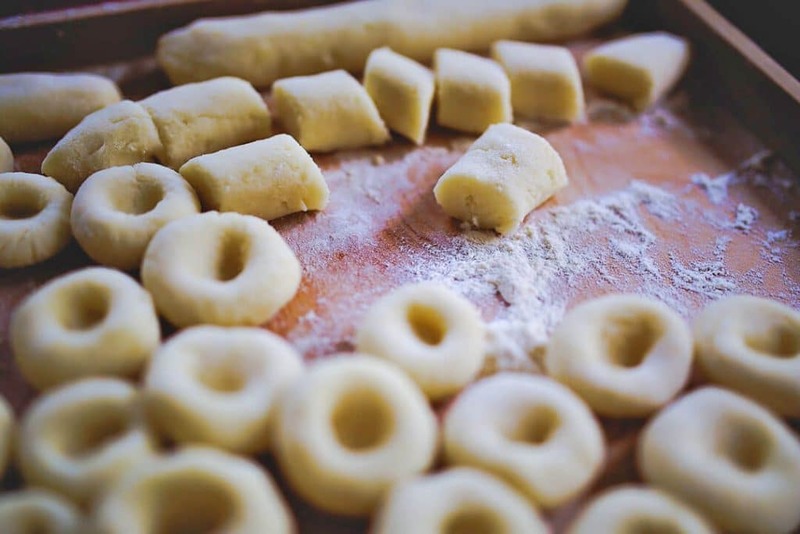 Deep fried pierogi sounds amazing, and I would love to try some strawberry pierogi too – let me know what you think when you do eventually try them! This sounds aaammmazzinngly delish!!! I haven’t had much Polish food, but you’re making me salivate. I hadn’t either, before to visit! What a cool interesting post. I never knew Pierogi is Poland’s national dish. They have so many varieties of Pierogi and I can much on so many of them. Loved it. Boy am I hungry now! I love pierogis – though I always think of the kind filled with potatoes and cheese with onions and bacon on top… Yum! (I think you said that’s the “Russian Pierogi”). I can imagine sampling all of the varieties in Krakow would be quite a treat! Especially if I get to follow it up with a tour of those 90 breweries. Definitely book marking this rundown of eateries as it seems to be quite comprehensive. Haha my fault, I know, sorry! 😀 The Russian pierogi are also my favorite, with bacon on the top, yum! OMG I have been to Krakow and still had never heard of this. I guess I missed out there but if I return will be sure to check these out. Aw how sad! You didn’t get to eat pierogi? I love your in-depth run-down of Pierogi in Krakow! I love Pierogies, but didn’t realise there were so many kinds! I’ve had the potato and cheese ones, but the fruit ones sound fascinating. So sad about the Jewish Quarter in Krakow, such a heavy and traumatic history. I hope to one day get to Krakow and experience the history, and many many wonderful pierogi! Krakow is a city that has suffered a lot but is now showing her scars with pride, because she survived. I find it absolutely fascinating! The food looks so tasty! I’m a foodie traveler as well, so this post will be super useful for next time when I will visit Poland. I really must try pierogi! Haha yes I know, should I feel guilty? 😀 And I was also veeery curious to try strawberry pierogi, I bet it’s delicious! I’m definitely hungry now! I actually live in an area of San Francisco where there is a mixed Polish and Russian community, with some dining options and markets. I’m seriously considering heading out for some pierogi now! haha great post! Oh do try them if you find someone who seels them! In Krakow food is inexpensive in general! Oooh you wouldn’t be disappointed! Never heard of Pierogi before. It looks very delicious. Will definitely try it next time Poland. One of my friend is visiting Poland next month, am gonna share this post with him. I have to admit that I’ve never in my life eaten dumplings that I would have liked, sorry, it has to be a matter of taste 😉 But I love Krakow, especially Kazimierz, and beer! Thus we particularly enjoyed Alchemia – they have great, quirky atmosphere 🙂 Highly recommended for anyone visiting Kazimierz and very easy to find. My husband loved Alchemia, it was definitely a cool place! I had never heard of pierogi before! Well, I’ve never been to Poland, Russia, Lithuania, Ukraine nor Slovakia so it isn’t that surprising. There’s a Polish restaurant not too far away from where I live, I should have a look if it’s on their menu. It looks so delicious on your photos. Thanks for sharing all this! Fruit Pierogi sounds interesting to the vegetarian in me. I can almost imagine the pink filling when you say Strawberry filling. But I also wonder if they steam it with the fruit inside – will that change the nature and taste of the fruit especially delicate fruits like strawberry. I can imagine a steamed banana or an Apple. Oh my goodness – this looks SO good!! My boyfriend visited Krakow late last year, and is keen to travel there with me. I definitely have to go, and I definitely need to eat some of these! Definitely keeping hold of this article! You wouldn’t be disappointed! 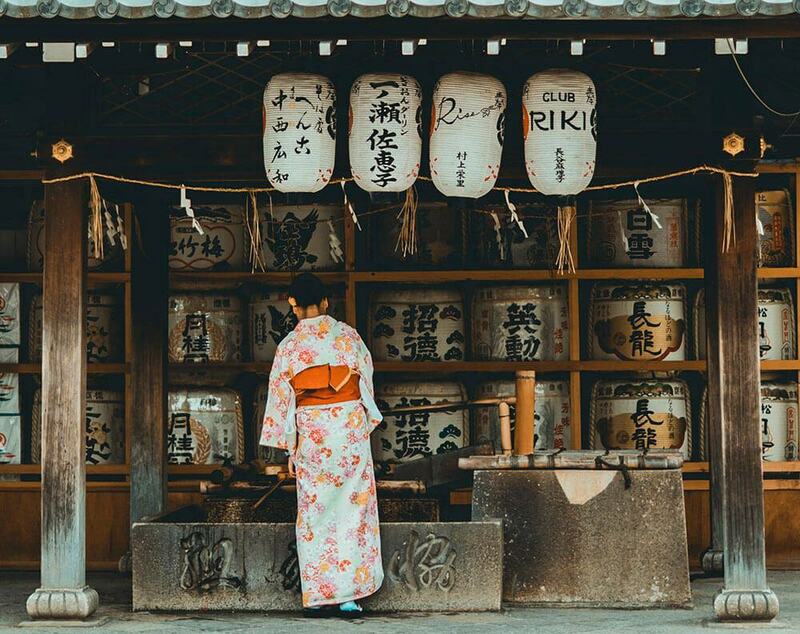 Everything is so inexpensive, the food is delicious and there’s so much to do! We just came back from Krakow last weekend and we ate so much! This is a great list, I don’t think you can ever have too much pierogi! This is awesome Hazel! Did you try some of the suggested restaurants? You’ve just made me so hungry!! So much valuable information here, I wish I had this in Krakow last year! We absolutely loved the food in Krakow, especially the perogies and the borscht. It muy have been pretty incredible doing all this research ☺️?? I have not yet been to Poland, but the food alone makes me ponder how I can make a trip happen. Living in London, Poland is just a hop, skip and jump away – so there is not really an excuse. 🙂 Happy Travels. Have a pierogi for me. We love to explore cities on a food trail, and we are now adding Krakow! I had a pierogi once in the US, but can’t wait to try to try it again. We’re always doing the same! Believe me, Krakow is SO cheap, we still can’t believe it! Oh yes! 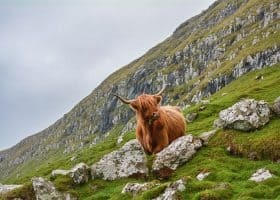 It’s a Country that has so much to offer! Same here, in Krakow we never had enough!